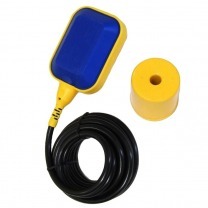 A float switch is used to monitor the level of a pond or tank. The water proof switch floats on the liquid surface. Depending on the type, the switch can be used to set a minimum and/or maximum level. For example, the switch can be used to turn on an alarm, a pump or a solenoid valve.